1 box or 10,000, we can help! CDs are a convenient and simple way to transfer and store files, pictures, and programs. But what are you supposed to do with them once you are done with them? Simply throwing them away or clearing the contents of the discs isn’t always enough—particularly if you have sensitive or confidential files on them. That’s why The Shredding Company of DC, MD, and VA provides secure CD destruction services on site, so you can be sure your files have been disposed of in full. If you need CD destruction in the Washington, DC Metropolitan area, call The Shredding Company at 877-258-3747 or contact us online. Our CD destruction services ensure that all CDs and the information contained on them are properly destroyed and discarded. Due to the nature of the technology, there’s really no way you can be sure your information is entirely secure unless you completely destroy the disc it’s contained on. Even if your data has been “erased” from the CD, it can still be accessed, which is why CD destruction is the only way to be 100 percent certain your files are safe. 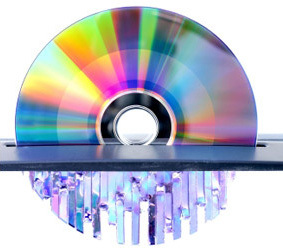 When you need CD destruction, our service technicians will come to your business to pick up your discs, and they can shred them on location at your facility, so you can watch your CDs being destroyed. We also provide a detailed certificate of destruction showing the date and the time of the CD pickup. If you’re in the DC Metropolitan area and you need CD destruction services, contact The Shredding Company today by calling 877-258-3747. We can perform one-time or ongoing shredding services at your place of business or home. Call us today to schedule your service or to learn more about our other material destruction services. If you need residential or commercial paper shredding and destruction services in MD, VA, or DC, contact The Shredding Company today. We can visit your home or business to securely and efficiently shred all your papers and documents. GETTING A QUOTE IS EASY. JUST FILL OUT THE FORM BELOW, ALONG WITH A LITTLE INFO ABOUT YOUR SHREDDING NEEDS, AND WE’LL BE IN TOUCH! Let us handle your document and materials destruction needs! © The Shredding Company, Inc. All Rights Reserved. The Shredding Company is a regional, locally owned and operated paper shredding service. We offer high security document and materials destruction services throughout the Washington, DC, Maryland and Northern Virginia marketplace.